Harvest fresh food from your very own garden. "Why grow your own food? Because then you get to eat it, of course! Growing your own food is rewarding. All it takes is time, patience, soil, water, and sunshine!" exclaims Katherine Hengel in Cool Basil from Garden to Table. According to urban farmer and HDB herb gardening advocate Balan Gopal, each herb has its own personality and behavioural pattern. It will be easier to work on each one once you understand its characteristics. "The joy of growing your own herbs and then snipping them off and cooking them...it is a brand new experience that you have to experience yourself to find out what it's all about," he says. But what to plant? Here are 12 must-have herbs to grow in your garden—and how you can enjoy each of them after harvest. Love tomato-based food such as pasta and pizza? It's time to start growing basil! "Basil is best known as a companion to tomatoes—spaghetti sauce, fresh or cooked, sliced tomatoes, pizza. Anything that combines the two is delightful," say Judy Barrett and Victor Z. Martin in What Can I Do with My Herbs? : How to Grow, Use, and Enjoy These Versatile Plants. 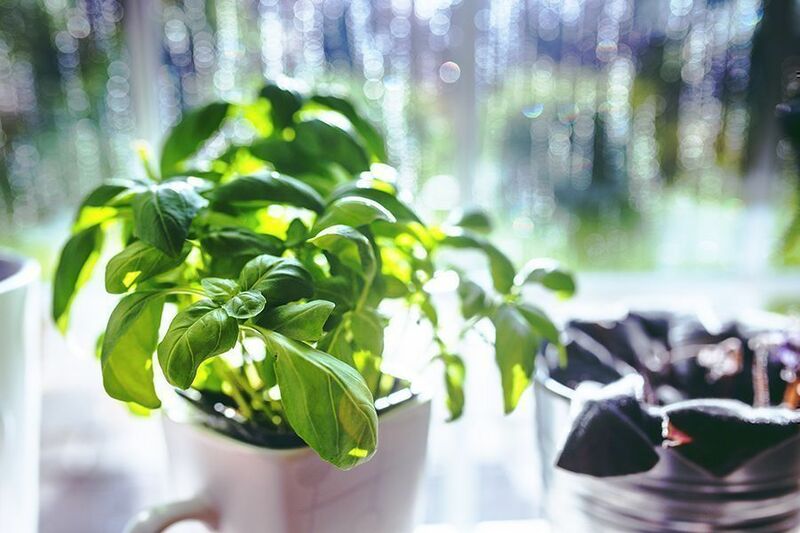 Another healthy reason to grow basil? Pesto! A popular garnish in dinner plates and salads, parsley is an almost universal herb and is often used in Mediterranean dishes. "It blends well with most other flavors and adds a mildly spicy taste of its own. You can snip it into sauces, butter, dressings, or just about any other dish," explain Barrett and Martin. Even though its leaves are small, the taste of thyme is large so it should be used sparingly. "Harvest anytime for use in the kitchen. English thyme is the most popular for cooking… lemon thyme is particularly useful in teas and in fish dishes," explain Toby Bost and Bob Polomski in Carolinas Gardener's Handbook: All You Need to Know to Plan, Plant & Maintain a Carolinas Garden. This is one herb you can use more frequently to season your dishes. You've come across this herb in a number of soup menus during your fancy dine outs. Salmon or corn chowder with chives, anyone? It's a flexible herb—you can eat it (include in your salad), use to season (thanks to its peppery-like flavour) and garnish dishes (use in herbal butter, salad dressings, or with chicken), or drink it (make a hot or iced tea with it). "Popular in Mediterranean, Indian, and Southwestern cooking, easily grown in diverse conditions and available in so many colorful and flavorful varieties, oregano is a staple in most cupboards," explains Carolee Snyder in Herbal Choices: A Gardening Novel With Herbal Recipes. Called the "Queen of the Scented Garden", this easy-to-grow herb is a good complement for savoury dishes and sweet desserts. Aside from its aromatherapy benefits, it can be made into tea, which is known to relieve stress and calm one down. With its fresh, lively taste, peppermints are used as table decorations as well as for flavouring food and enlivening salad dishes. According to Barrett and Martin, "peppermint is the strongest of the mints. Some people drink peppermint tea to soothe an upset stomach." You plant coriander seeds and harvest cilantro (the green leaves). If you find your sour cream too boring, then add chopped coriander for that extra kick. Also, throwing in some of this herb toward the end of your stir-fry will leave a strong fresh flavour to your dish. Oh, how do we count the ways we can use this pungent herb in the kitchen! You can use its sprigs to make flavoured olive oil, add flavour to your rib-eye steak, or throw into your roasted potatoes. The list is endless—just look at French and Italian cuisines. "A robust flavour, sage is best used where you can really taste it, such as Feta and Sage Relish, or else as part of a bouquet of herbs in a stew or stock. Sage is a wonderful healer, perfect with lots of honey for sore throat, the flu, or colds," advise Chupi and Luke Sweetman in What to Eat When You Can't Eat Anything: The Complete Allergy Cookbook. The lemon-scented member of the mint family can be used "fresh, frozen, or preserved in oil, wine, or vinegar to impart a fresh, lemony flavour to various dishes," say Bost and Polomski. Learn more about herb gardening here. Which of these herbs do you have in your garden and which one do you want to grow? Share with us at hello@cromly.com.